Pepperminty Wiki is a complete wiki contained in a single file, inspired by @am2064’s Minty Wiki. It’s open source too (under MPL-2.0), so contributions are welcome! Developed by Starbeamrainbowlabs (though contributions from others are welcome! 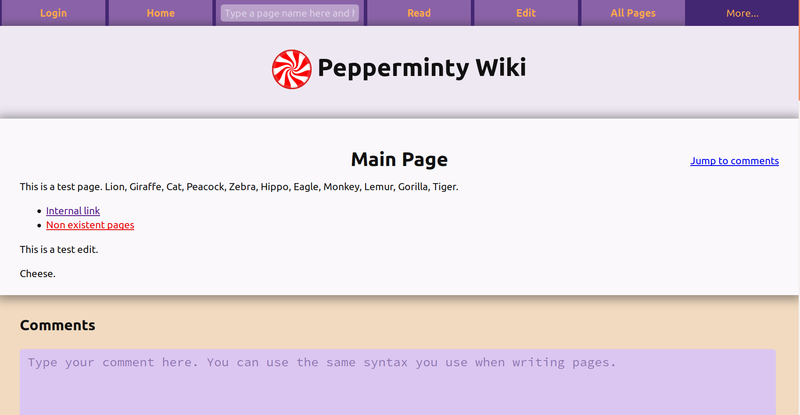 ), Pepperminty Wiki has a variety of useful (and cool!) features - such as file upload, a dynamic help page, page revision history, page tags, and more! Other amazing features are in the works too (like a theme gallery, autoupdate, and user watchlists), so check the release notes to see what’s been added recently. Above: The Main Page used for testing purposes. Basic ‘search’ bar A full text search engine! If you want a pre-built stable version, then you can use the latest release. It has a changelog that tells you what has changed since the last release, along with a pre-built version with all the latest modules. If you’re feeling lazy, you can grab the bleeding-edge version from this respository, which comes with all the latest modules. You can get it here. Pepperminty Wiki has a downloader that you can use to select the modules you want to include in your install. The online downloader will give you the latest stable release. You can find it here. You can also you the downloader offline. Simply clone this repository to your web server and then point your web browser at your.server/path/to/perppminty/wiki/download.php. Simply run the build.bat script in the root of the repository. It will handle everything for you. Actually builds Pepperminty Wiki. Outputs to index.php. To configure your new install, make sure that you’ve loaded the wiki in your browser at least once. Then open peppermint.json in your favourite text editor. An explanation of each of the settings can be found below. If you need any help, just contact me or open an issue. Please note that configuration of Pepperminty Wiki will be done through a GUI soon. sitename string The site’s name. Used all over the place. Note that by default the session cookie is prefixed with a variant of the sitename, so changing this will log everyone out! logo_url url A url that points to the site’s logo. Leave blank to disable. When enabled, the logo will be inserted next to the site name on every page. updateurl url The url from which to fetch updates. Defaults to the master (development) branch. If there is sufficient demand, a separate stable branch will be created. Note that if you use the automatic updater currently it won’t save your module choices. MAKE SURE THAT THIS POINTS TO A HTTPS URL, OTHERWISE SOMEONE COULD INJECT A VIRUS INTO YOUR WIKI! sitesecret string The secret key used to perform ‘dangerous’ actions, like updating the wiki. It is strongly advised that you change this! delayed_indexing_time integer The amount of time, in seconds, that pages should be blocked from being indexed by search engines after their last edit. Set to 0 to disable. This is called delayed indexing. More information can be found here. editing boolean Determines whether editing is enabled. Set to false to disable disting for all users (anonymous or otherwise). maxpagesize integer The maximum number of characters allowed on a single page. The default is 135,000 characters, which is about 50 pages. clean_raw_html boolean Whether page sources should be cleaned of HTML before rendering. If set to true any raw HTML will be escaped before rendering. Note that this shouldn’t affect code blocks - they should alwys be escaped. It is STRONGLY recommended that you keep this option turned on, ESPECIALLY if you allow anonymous edits as no sanitizing whatsoever is performed on the HTML. If you need a feature that the markdown parser doesn’t have, please open an issue. Also note that some parsers may override this setting and escape HTML sequences anyway. enable_math_rendering boolean Whether to enable client side mathematical expression parsing. When enabled LaTeX mathematical expressions can be enclosed in dollar signs like so: $x^2$. Turn off if you don’t use it. anonedits boolean Determines whether users who aren’t logged in are allowed to edit your wiki. Set to true to allow anonymous users to edit the wiki. defaultpage string The name of the page that will act as the home page for the wiki. This page will be served if the user didn’t specify a page. defaultaction action name The default action. This action will be performed if no other action is specified. It is recommended you set this to “view” - that way the user automatically views the default page (see above). parser parser name The parser to use when rendering pages. Defaults to ‘default’, which is a modified version of slimdown, originally written by Johnny Broadway. show_subpages boolean Whether to show a list of subpages at the bottom of the page. subpages_display_depth number The depth to which we should display when listing subpages at the bottom of the page. max_recent_changes number The maximum number of recent changes to display on the recent changes page. optimize_pages boolean Whether to optimise all webpages generated. Currently this option only minifies inline css. users array of users An array of usernames and passwords - passwords should be hashed with sha256. Put one user / password on each line, remembering the comma at the end. The last user in the list doesn’t need a comma after their details though. Tip: use the hash action to hash passwords appropriately for Pepperminty Wiki, but remember to use an incognito window! require_login_view boolean Whether to require that users login before they do anything else. If you combine this setting with the data_storage_dir option to move the storage directory outside your web root, this will completely hide your wiki from anyone who isn’t logged in. data_storage_dir path The directory in which to store all files, except this main index.php. A single dot (‘.’) denotes the current directory. Remember to omit the trailing slash from the directory name, as it is added automatically by Pepperminty Wiki. Combine with require_login_view in order to completely hide your wiki from anonymous users. use_sha3 boolean Whether to use the new sha3 hashing algorithm that was standardised on the 8th August 2015. Only works if you have strawbrary’s sha3 extension installed. Get it here: https://github.com/strawbrary/php-sha3 Note: If you change this settings, make sure to update the password hashes above! Note that the hash action is aware of this option and will hash passwords appropriately based on this setting. admins array of usernames An array of usernames that are administrators. Administrators can delete and move pages. admindisplaychar string The string that is prepended before an admin’s name on the nav bar. Defaults to a diamond shape (◆). admindetails_name string The name of the site administrator. Since users can only be added by editing the settings file, people will need a contact name and address to use to ask for an account. Displayed at the bottom of the page. admindetails_email string The email address of the site administrator. Used in conjunction with the above. Will be appropriately obfusticated to deter spammers when displayed. export_allow_only_admins boolean Whether to only allow adminstrators to export the your wiki as a zip using the page-export module. nav_links array An array of links and display text to display at the top of the site. See the comment in the settings file for more details. nav_links_extra array An array of additional links in the above format that will be shown under “More” subsection, in the same format as the above. nav_links_bottom array An array of links in the above format that will be shown at the bottom of the page, the same format as the above 2.
footer_message string( + HTML) A message that will appear at the bottom of every page. May contain HTML. editing_message string( + HTML) A message that will appear just before the submit button on the editing page. May contain HTML. upload_enabled boolean Whether to allow image uploads to the server. upload_allowed_file_types array of strings An array of mime types that are allowed to be uploaded. Note that Pepperminty Wiki only does minimal checking of the actual content that is being uploaded - so please don’t add any dangerous file types here on a parmanant bases for your own safety! preview_file_type mime type The default file type for previews. Defaults to image/png. Also supports image/jpeg and image/webp. image/webp is a new image format that reduces image sizez by ~20%, but PHP still has some issues with invalid webp images. default_preview_size number The default size of preview images. mime_extension_mappings_location path The location of a file that maps mime types onto file extensions and vice versa. Used to generate the file extension for an uploaded file. Set to the default location of the mime.types file on Linux. If you aren’t using linux, download this pastebin and point this setting at it instead. mime_mappings_overrides array of strings An array of override mime mappings to translate mime types into the appropriate file extension. Use if the file pointed to by the above assigns weird file extensions to any file types. min_preview_size number The minimum allowed size for generated preview images in pixels. max_preview_size number The maximum allowed size for generated preview images in pixels. search_characters_context number The number of characters that should be displayed either side of a matching term in the context below each search result. search_title_matches_weighting number The weighting to give to search term matches found in a page’s title. search_tags_matches_weighting number The weighting to give to search term matches found in a page’s tags. css string of css A string of css to include. Will be included in every page. This may also be an absolute url that references an external stylesheet. favicon url A url that points to the favicon for your wiki. session_prefix string The prefix that should be used in the names of the session variables. Defaults to an all lower case version of the site name with all non alphanumeric characters removed (The special value auto does this). Remember that changing this will log everyone out since the session variable’s name will have changed. Normally you won’t have to change this - This setting is left over from when we used a cookie to store login details. By default this is set to a safe variant of your site name. I have documented the current API and other things that make Pepperminty Wiki tick that you can use to create your own modules. You can find this documentation in the Module_API_Docs.md file in this repository. I’ve also documented Pepperminty Wiki’s entire REST API using apiDoc. You can view the docs here. If you do create a module, I’d love to hear about it. Even better, send a pull request! Here’s a list of things that I want to add at some point (please feel free to send a pull request and help out!). Is the feature you want to see not on this list or not implemented yet? Open an issue or send a pull request! Pepperminty Wiki is released under the Mozilla Public License 2.0. The full license text is included in the LICENSE file in this repository.